Several thousand of people took part in an unsanctioned nationalist march through central Vilnius on Monday afternoon. Such marches are traditionally held on March 11 when Lithuania marks the Day of Restoration of Independence. Kęstutis Lančinskas, chief of Vilnius County Police Headquarters, told BNS that around 3,000 people took part in the march during which no major incidents were recorded. Accompanied by a large number of police officers, the crowd of people of all ages and carrying Lithuanian tricolors moved from the Cathedral Square along Gedimino Avenue at 4 PM. They chanted "Lithuania" and sang patriotic songs. 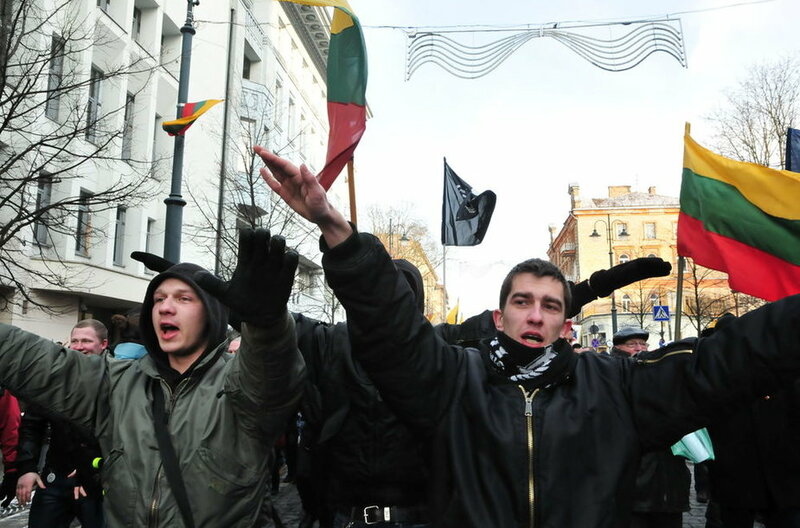 The controversial chant "Lithuania for Lithuanians" was heard several times during the march but it was not as dominant as in similar events previously. The marchers soon reached Lukiškės Square where, after several speeches, the crowds started dissolving. Six people were arrested during the event for being drunk in public. No major incidents were recorded, according to the police. Several Lithuanian politicians took part in the march. Activists of anti-fascist organizations were seen protesting the event. Vilnius authorities had not issued permission for a march on Gedimino Avenue and nationalist youth organizations refused to hold a march on Upės Street a little further from the city center, a site proposed by the authorities. The Lithuanian Nationalist Youth Union appealed against the decision but a Vilnius court rejected the appeal, saying that state institutions have a prerogative to choose locations for marking official holidays.